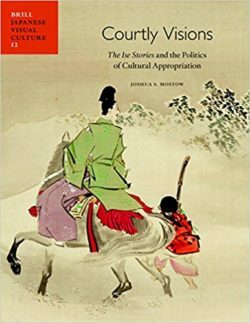 Courtly Visions: The Ise Stories and the Politics of Cultural Appropriation traces—through the visual and literary record—the reception and use of the tenth-century literary romance through the seventeenth century. Ise monogatari (The Ise Stories) takes shape in a salon of politically disenfranchised courtiers, then transforms later in the Heian period (794-1185) into a key subtext for autobiographical writings by female aristocrats. In the twelfth century it is turned into an esoteric religious text, while in the fourteenth it is used as cultural capital in the struggles within the imperial household. Mostow further examines the development of the standardized iconographies of the Rinpa school and the printed Saga-bon edition, exploring what these tell us about how the Ise was being read and why. The study ends with an Epilogue that briefly surveys the uses Ise was put to throughout the Edo period and into the modern day.